Elima-Matic’s non-stalling, lube-free air valve system allows the Elima-Matic® E3 3″ Air Operated Double Diaphragm Pump to provide reliable performance. 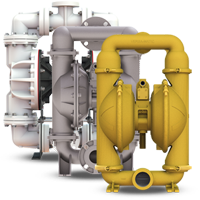 Available in clamped or bolted models, with leak-free design that reduces downtime and ensures continuous operation. Elima-Matic® E3 3″ Air Operated Double Diaphragm Pump provides you more options to match your application needs, while delivering an unsurpassed level of reliability. Each Elima-Matic® E3 3″ Air Operated Double Diaphragm Pump features an innovative air-valve system that eliminates stalling, icing and the need to lubricate, so you achieve reduced downtime and continued pump performance. Click here for E3 detailed specifications. Click here for E3 brochure.